188 1942 [underlined 5 times in descending size lines] January 1942. The WCTU met Jan. 20, 1942 with Edna Sherman. Mrs. L. May Fleever, County Supt. of Evangelistic work made her monthly report to our local union, and was advised by Miss Sherman to send her report blanks to Mrs. Vista Baker of Searsboro and Mrs. Molison of Malcom. Mrs. Mitchell said not to burden Mrs. Molison with a blank, as she lives in the country and could not do the work. Mrs. Fleener asks how many books sent for soldiers? Miss Sherman and Mr. John Evans sent books. Mrs. Mitchell says mending is being done for the hospital. Says to announce this in the Herald-Register. Announcement made that we have two new members: Mrs. Lela V. Evans of South Side Friends' Church Mrs. Renaud Also that Mrs. Elmer Rickard pays her dues today. Miss Sherman speaks of a new senator as "a good, new, dry senator from Texas," W. Lee O'Daniel, who has written her a letter. She says with regret, "The Shepherd bill was turned down 2 to 1." Minutes of Dec. mtg. read and approved. 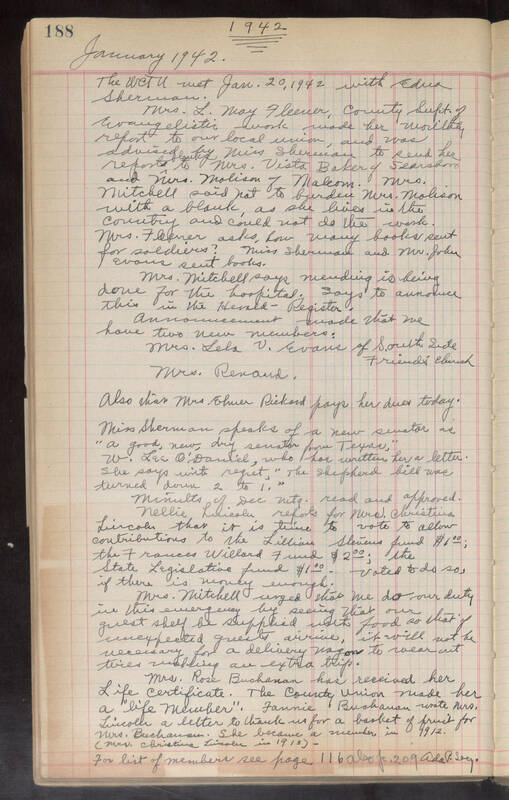 Nellie Lincoln reports for Mrs. Christina Lincoln that it is time to vote to allow contributions to the Lillian Stevens fund $1 00; the Frances Willard Fund $2 00; the State Legislative fund $1 00. Voted to do so, if there is money enough. Mrs. Mitchell urged that we do our duty in this emergency by seeing that our guest shelf be supplied with food so that if unexpected guests arrive, it will not be necessary for a delivery wagon to wear out tires making an extra trip. Mrs. Rose Buchanan has received her Life Certificate. The County Union made her a "life member". Fannie Buchanan wrote Mrs. Lincoln a letter to thank us for a basket of fruit for Mrs. Buchanan. She became a member in 1912. (Mrs. Christina Lincoln in 1913)- For list of member see page 116 also p. 209 Ada P. Secy.